These are just some examples of the sorts of skills involved in phonological awareness. These are key skills involved in both speech and reading. Some children with speech difficulties (not all) find these sorts of tasks really difficult. At first glance, it seems like a lot of these skills could be due to a hearing difficulty. Of course, children with hearing difficulties are likely to find these sorts of things challenging, but most children who struggle with phonological awareness don’t have a problem with their ears at all. It is more about the child’s brain not recognising differences between sounds, than their ears not hearing them. We are talking about speech sounds not written letters. It is important that you say the pure sound, not the letter name and that you don’t add an “uh” sound after the sound when you say it. For example, it is “mmmm” rather than “muh” and “p” rather than “puh”. The purpose of these activities is to train the child’s listening skills, not to teach them letter recognition. With young children (especially preschoolers) it is usually best to use symbols or pictures to represent the different sounds. I usually use the Jolly Phonics pictures. Often it can be good to have the written letter as well, but if the child is struggling, it is important to know what is hard – is it recognising which sound is which or is it reading the letters? Make sure the child is familiar with the symbols before you start. These are listening games for the child not talking ones. Often, when I say to a child “which one is p?” for example, they will try to say the sound back to me. If producing sound is what we are practising, then that’s great! However, if we are playing this sort of listening game, it can confuse the child. For example, let’s imagine that the child cannot say “p” yet. He says “b” instead. When I say, “which one is p?”, he will say “b”. Now the last sound he has heard is “b”. It is likely to be difficult for him to find the sound I asked for. I tend to encourage children to just listen rather than saying the sounds. A child may be able to tell the difference between two sounds when they hear a single sound, but find it more difficult to tell which sound is in a word. For example, a child may be able to tell that “fff” and “p” sound different, but struggle to recognise the difference between “fair” and “pear” or tell that “four” starts with a “f”. All of these things are slightly different skills. Try not to jump between them, just start with listening to single sounds. Like all skills, different abilities are expected at different ages. This is a topic for another day, but be aware that very young children (younger than 3 – 3 1/2) may find listening to sounds difficult, just because they are too young. I would not expect children under 3 to be able to do these activities successfully. Attach 2 or 3 different sound pictures to skittles and space the skittles out. Say one of the sounds and see if the child can knock down the one that you said. Stick 2 or 3 different sound pictures up around the room. Say one of the sounds and see if your child can run to the one you said. Use Duplo or Lego bricks or something else that you can build with. Have 2 or 3 different piles, one for each sound. Say a sound and see if your child can add a brick to the correct tower. Lay 2 or 3 different sounds pictures, spaced out across the floor. Say one of the sounds and see if the child can throw a beanbag/ rolled up sock/ soft toy onto the one that you said. 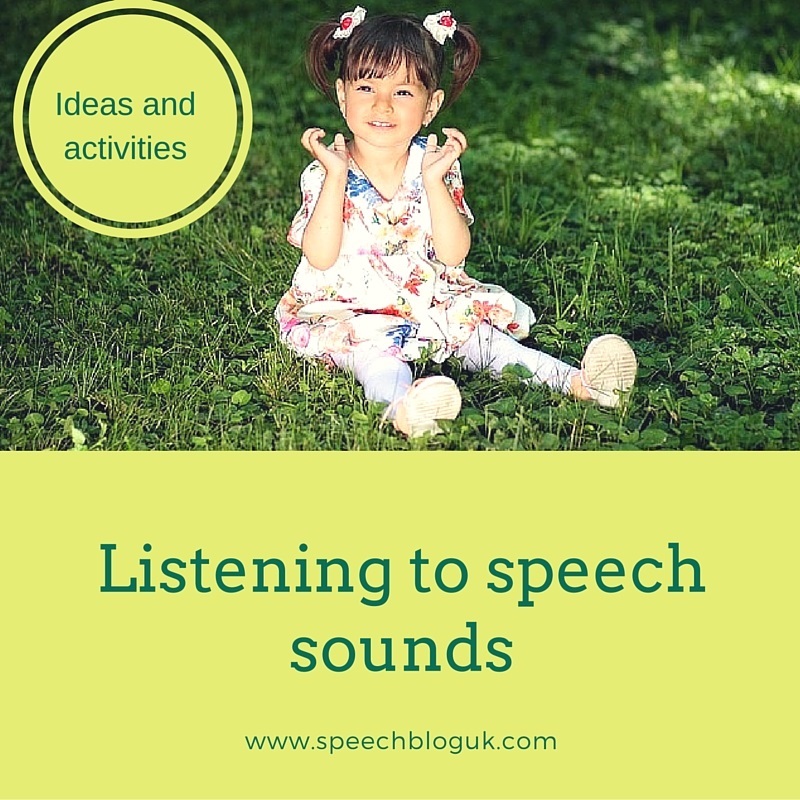 What other activities do you use to practise listening to different speech sounds? How to use Dinosaurs in Speech Therapy!